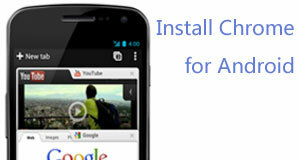 Google just launched a beta version of Chrome for Android on February 07, 2012. With this beta version, you can browse fast on your Android smartphone or tablet, and bring your personalized Chrome experience with you anywhere you go. Like the desktop version, Chrome for Android Beta is focused on speed and simplicity. Check whether Chrome for Android Beta is available for your device: Android 4.0+, Ice Cream Sandwich. Download Chrome for Android Beta from the Android Market. On your computer: Click Install, then choose the device where you want to install the browser. On your mobile device: Touch Download., then touch Accept & download. When the installation is complete, you will find the Chrome icon on the Home or All Apps screen. Touch the icon to open the browser. Introducing Android 4.0 - Android 4.0 (Ice Cream Sandwich) is the latest version of the Android platform for phones, tablets, and more. It builds on the things people love most about Android - easy multitasking, rich notifications, customizable home screens, resizable widgets, and deep interactivity - and adds powerful new ways of communicating and sharing. Love it, replaced the stock browser for 99% of sites already. Needs UA switch and why does it open YouTube videos in browser instead of sending them to the app? I'm sure these minor issues will be fixed soon. Wow! What an improvement over stock browser. Super smooth on Galaxy Nexus 4.0.2. Pinch zoom is fricken phenomenal! Tabs are easy to use. Wouldn't mind having a close program option in the upper right pull-down. Thanks Google. Loads sites and tabs very quickly, like desktop Chrome. But choppy scrolling and navigation (just like the stock ICS browser) means I'm sticking with Opera Mobile for now.